This article is a work in progress and in no way final. Molly Scarbrough, Planning and Development Review, discussed traffic volumes on Morrow Street west of Lamar, and traffic assumptions if the existing traffic barrier is removed. She stated that removing the barrier will increase traffic on Morrow, but the traffic volume will be less than before the installation of the barriers. She said the City does not have a compelling reason to either remove or leave the barrier in place, but noted that there will be staff costs associated with removing the barrier. Options include pursuing long-term improvements to provide better east/west access, a recommendation that the neighborhoods continue to work together to find a solution, and that the neighborhood work with Midtown Commons and others to provide needed neighborhood services. Council Member Cole said the neighborhoods are in a state of growth and there is a need for a long term solution for two neighborhoods with traffic congestion issues. She said she was not in a position to make a recommendation to Council because the neighborhoods have not come to any agreement on a proposed solution. She therefore suggested that staff hire a facilitator to reconvene the two neighborhoods in order to make a recommendation for a solution to CPTC and the City Council. Suggestion: staff hire a facilitator to reconvene the two neighborhoods in order to make a solution to CPTC and City Council. Council Member Cole moved approval of the staff recommendation recognizing that the entire subcommittee has struggled to come up with a compromise to promote public safety between the Crestview and Highland neighborhoods. Council Member Morrison seconded the motion. The motion carried by a vote of 3-0. The recommendations from Feb 14th, 2011 have obviously stalled. Although we could ask that these actions are re-started, the risk is that the condition of “sidewalks first, porkchop removal second” still exists. What it the City takes 4 years to build those sidewalks? The records also document the level of animosity between the two neighborhood groups in 2011, something that City staff never like to get involved in – see the usual city response in the May 3rd, 2010 document: hire a facilitator and let the stakeholders duke it out until consensus is reached. The idea: Crestview NA and Highland NA write a joint resolution supporting the removal of the porkchop, without any conditions, effective immediately. This should, in the name of co-operation, bypass any existing recommendations. Crestview requested a pedestrian beacon at Banyon & Crestland, which we gladly accepted. Crestview to vote on this … April? Nov 10, 2014: CoA BoA denies appeal of Land Use Determination made by zoning staff 10/1/14 regarding legal, nonconforming status of existing use. The March meeting is on Tuesday, 4th of March, at TA Brown Elementary, starting at 6pm. It’s a pot luck, as usual for the March meetings, so bring a dish and come meet your new HNA members. There’s a whole bunch. See you all (I hope) at the March meeting. Neighbours, a quick update and request for action regarding the City’s attempts to run rail where it doesn’t make much sense. An advisory board is due to make a recommendation Dec 6th to the City on where to run rail, and November 2014 their plan will be turned over to the voters in a bond election. Their favored choice, and the City’s, continues to be the option that serves Mueller, the new UT Medical School, and the UT stadium. Considering that the advisory board, the CCAG, was appointed by our Mayor, and includes the Mayor, Seton CEO Greg Hartman & UT VP Pat Clubb, we have a sneaking suspicion that their recommendation will, once again, be Mueller / UT Medical School / UT stadium. The UT student government has voted against this, and in fact, supports the obvious Lamar / Guadalupe option as it serves West Campus. You may notice that the chosen corridor is labelled “Highland”, but this is disingenuous at best. The corridor extends north from UT down Red River to Highland ACC. However, the rail plan terminates at Hancock. While they may connect Urban Rail to the Red Line Commuter Train in the future, you’d need to change trains to move further north. They have however detailed how Urban Rail will be extended to Mueller. Red River (AKA “Highland”) and East River Side were chosen because, according to Project Connect, they have the greatest congestion and possible economic development. Much of their decision was based on future projections, when current data shows that North Lamar has the highest transit ridership, highest population density, and is one of the top 4 congested roadways in Austin and ranked in the 100 most congested roadway in TEXAS according to TxDot. 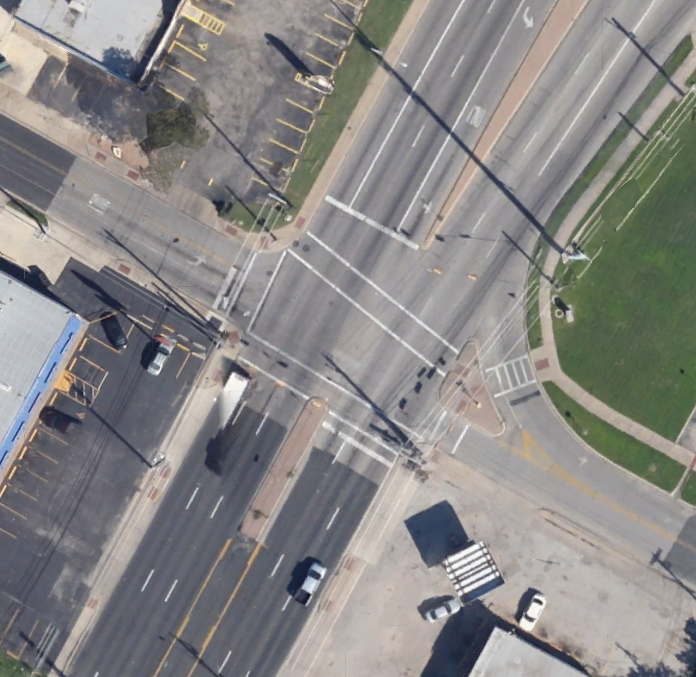 Additionally, rail on Lamar and Guadalupe would put tracks within a 10 minute walk of 31% of the jobs in the city. The development possibility is based upon where they WANT growth to go, because where the rail goes developers will follow. HNA has signed a resolution endorsing Urban Rail on Lamar-Guadalupe as recommend in the 2003 Neighborhood Plan, and based upon the support for a Lamar line in an online poll distributed through the list serves. Efficient and convenient public transport down Lamar and Guadalupe would serve Highland residents who are faced with congestion at every southbound route from Highland. Once again, we need neighbours, friends, Austinites, to take a few minutes to sign the rail petition at the end of this article and to call and email City Council to state support for rail on Lamar and to ask them to put West Campus back into the Lamar corridor. There are groups working against the City’s plans, and as long as they can submit overwhelming evidence for what the people Austin and the people of Highland want, they can get the City to look at ALL the data and see the reality of where rail should go. “Austin cannot afford another badly designed urban rail implementation”. If the City spends the money to build more rail (and it will do so), it needs to be effective. It needs to serve as many people as possible. It needs to reduce congestion on some of the most congested roads in Texas. What it does not need to do is serve the private interests of our elected officials and large businesses. The Central Austin Community Development Corporation is spearheading the grassroots effort for rail on Lamar and Guadalupe, along with the biggest rail advocates in the city. Their Urban Rail page explains in detail why rail to Lamar is superior to Mueller. The HNa Winter 2013 Newsletter has been released. 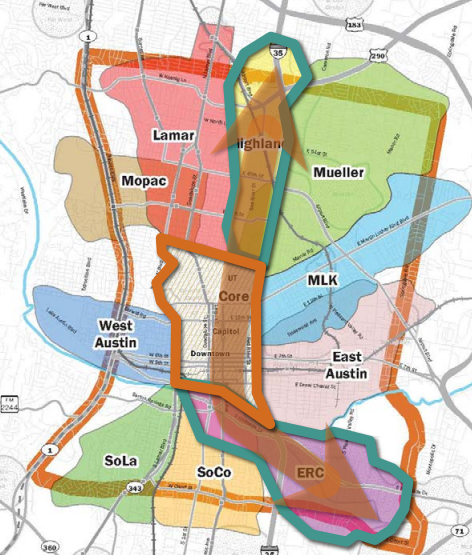 The City has been going through a process via Project Connect (http://connectcentraltexas.com/) to determine which corridor should be the first in Austin to get light rail. Mueller has been identified as a priority alignment. Many long time local rail advocates have been working to support an alternate route down Guadalupe-Lamar, and believe that the public should have a part in the discussion. As a result, Project Connect is holding public input meetings this week and next. If you would like to help determine the transit future for Austin and Highland, we encourage you to attend. The schedule of upcoming meetings is at the bottom of the page. This KUT article contains a fairly balanced overview of the two lines with maps of both. The Austin Community Development Corporation (CACDC) is lobbying for the Guadalupe-Lamar line through our neighborhood, and are asking for Highland’s support. 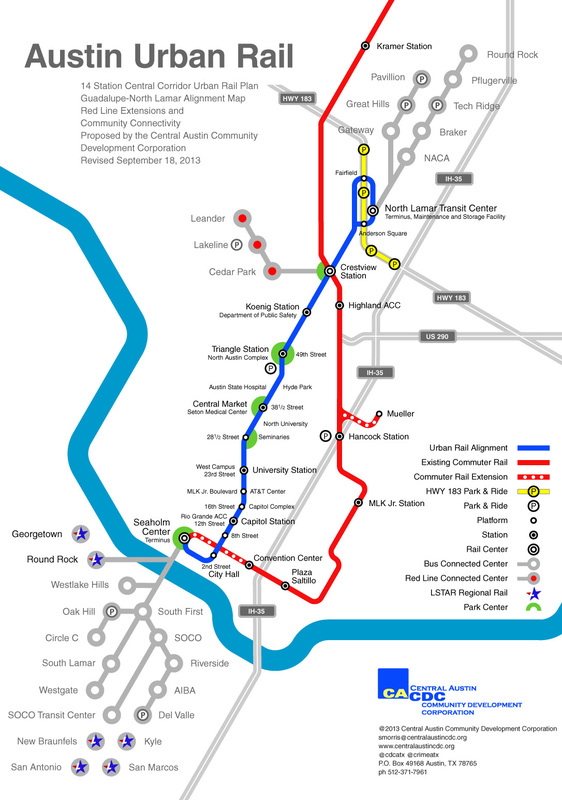 Their website gives a detailed list of the benefits of a Guadalupe-Lamar line, along with a list of proposed stops. It also provides easy to read comparative data between the two lines. The HNA would like to poll our neighbors’ opinions on which line they would prefer, and have created a quick rail poll, see below.